NADI-FIJI – Vijay Singh of Fiji in action on day one of the Fiji International at the Natadola Bay Championship Golf Course, Nadi Fiji, Thursday, August 14, 2014 .The US$ 1 million tournament is part of the OneAsia circuit. Picture by Paul Lakatos/OneAsia. Meet the man who builds the Fiji International; Darren Burgess, a Tournament Productions Manager with more than 24 years of experience. 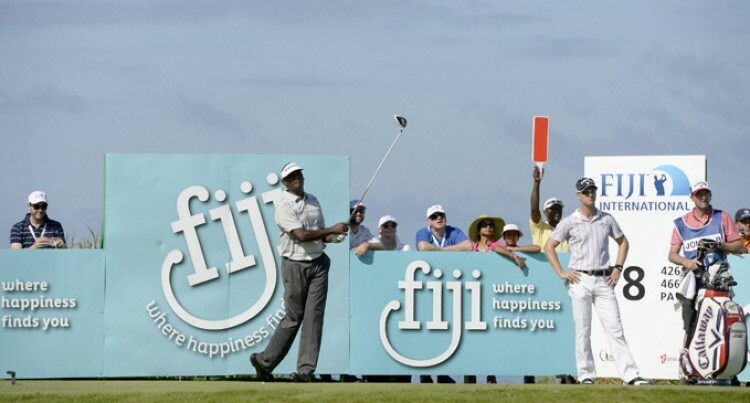 The Fiji International is one of the biggest sporting events staged in Fiji each year. Attracting some of the best golfers in the world and broadcast to more than 400 million homes globally, a lot happens behind the scenes to ensure the tournament is staged to world class standards. Burgess is the man that makes that happen. Responsible for turning the stunning Natadola Bay Championship Golf Course into the Fiji International, Burgess and his team install marquees, bures, advertising signage, temporary office structures, television towers and build scoreboards and then dismantle it all once the champion is crowned. It’s a role that brings Burgess to Fiji six weeks prior to the start of the tournament and it’s a role he loves. “The highlight of the Fiji International every year for me is getting to work alongside the local people. The relationships I have built whilst working at Natadola Bay are what makes the tournament special to me,” said Burgess. Looking to expand the family, Burgess is excited about hiring a Tournament Production Assistant to take over the reins in the future. “Producing an event to the level required for the Fiji International is a huge job, lots of pre-planning work goes into the tournament before I even arrive on site at Natadola Bay,” added Burgess. With the European Tour co-sanctioning the Fiji International alongside the PGA Tour of Australasia in 2016, this year’s tournament set up is going to be even bigger. It will require more temporary offices, an increased number of television towers and new on course signage. The addition of the European Tour also means more people around the world will be watching the tournament. Being a perfectionist, Burgess wants the tournament his team delivers to look like the best in the world. “400 million homes watching the Fiji International, that’s a lot of people that we want to impress and communicate to. A professional and high quality tournament set-up is all part of creating the overall tournament experience, both for spectators on site and those watching on TV,” said Burgess, who is confident his team will deliver the best Fiji International in the tournament’s third staging. The Fiji International will be played at Natadola Bay Championship Golf Course from 6-9 October 2016. For more information please visit fijiinternational.com.au.